Understanding the physical properties and dynamical behavior of nanochannel flows has been of great interest in recent years and is important for the theoretical study of fluid dynamics and engineering applications in physics, chemistry, medicine, and electronics. The flows inside nanoscale pores are also important due to their highly beneficial drag and heat transfer properties. 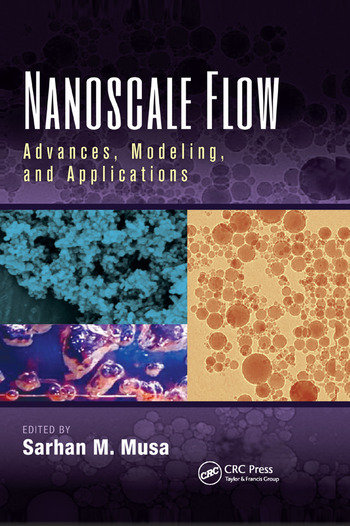 A valuable reference for engineers, scientists, and biologists, Nanoscale Flow: Advances, Modeling, and Applications is also designed for researchers, universities, industrial institutions, and government, giving it broad appeal. Sarhan M. Musa, Ph.D, is associate professor in the Department of Engineering Technology, Roy G. Perry College of Engineering, at Prairie View A&M University, Texas. He has been director of the Prairie View Networking Academy, Texas since 2004. Dr. Musa has published more than a hundred papers in peer-reviewed journals and conferences, is a frequent invited speaker on computational nanotechnology, has consulted for multiple organizations nationally and internationally, and has written and edited several books, including Computational Nanotechnology Modeling and Applications with MATLAB®. He is a senior member of the IEEE and an LTD Sprint and Boeing Welliver fellow.